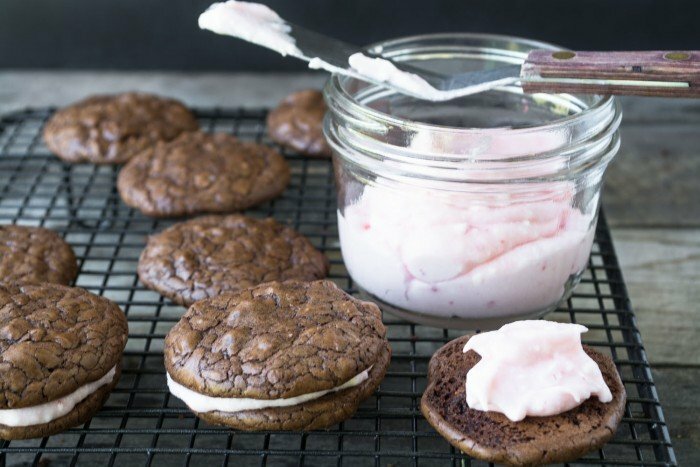 My Chocolate Peppermint Sandwich Cookies have a creamy layer of peppermint filling in between two soft and chewy brownie cookies ~ these rich treats are a perfect addition to your holiday cookie assortment! Hi all — welcome to my Reader’s Recipes series of holiday cookies. I’m going to be sharing YOUR family recipes here on Saturdays from now until the New Year. Thanks to all of you who’ve sent in recipes for me to try! 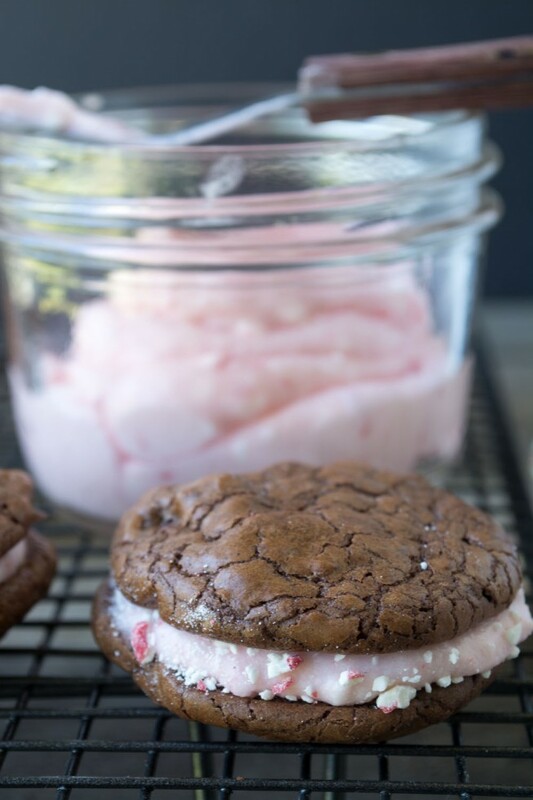 Today’s recipe for Chocolate Peppermint Sandwich Cookies was sent in by Madeleine from San Jose California. 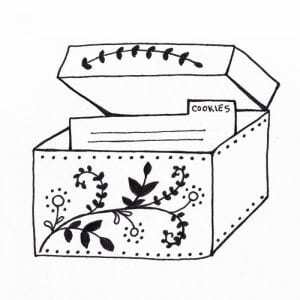 She says she’s an avid baker and goes crazy every holiday season baking at least ten different cookie recipes for her annual cookie gift box. She picks one new cookie to try every year and this outstanding cookie debuted last December — it was a huge hit with all her friends. I think you guys are going to flip for these, too. I loved them because the chocolate sandwich cookies are deliciously chocolaty enough to stand on their own. They taste like tender little brownies. But Madeleine takes it a step further and folds in mini semi-sweet chips at the last minute so you get a double dose of chocolate. The peppermint filling is a little bit of a surprise, and the whole thing reminds me of one of my favorite holiday tastes, peppermint bark. I have to admit I usually shy away from sandwich cookies because, let’s face it, they’re a little more work. But every time I do make them, I’m wowed. 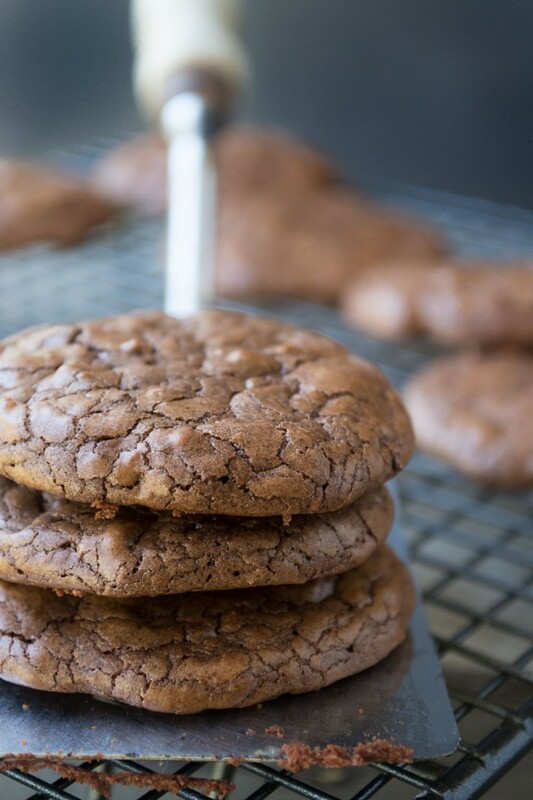 This recipe only makes about 15 or so cookies, but they’re substantial, one will satisfy you. I think they’d be a great addition to a collection, and it goes without saying that you can play with the filling in a million ways. If you don’t love peppermint I’d go for peanut butter, espresso, mocha, or vanilla bean. Or how about cardamom, caramel, cookie butter, or Nutella! 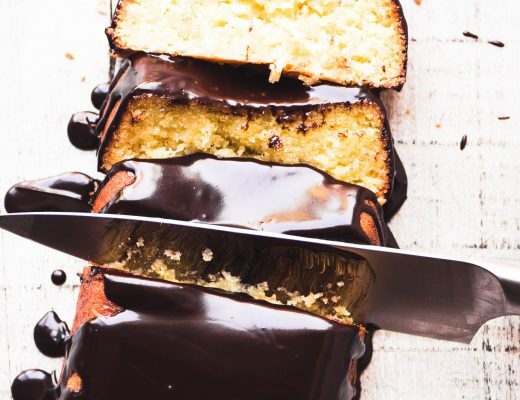 You can use your favorite frosting recipe, or just vary the simple butter and confectioner’s sugar formula, below. 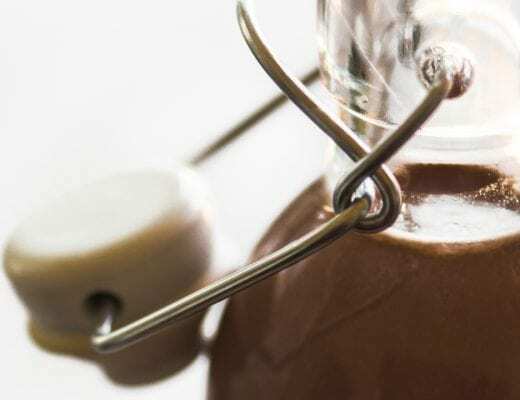 You can also use the peanut butter, Nutella, or a thick caramel sauce straight from the jar, yum! The cookies are soft and chewy, and really delightful. 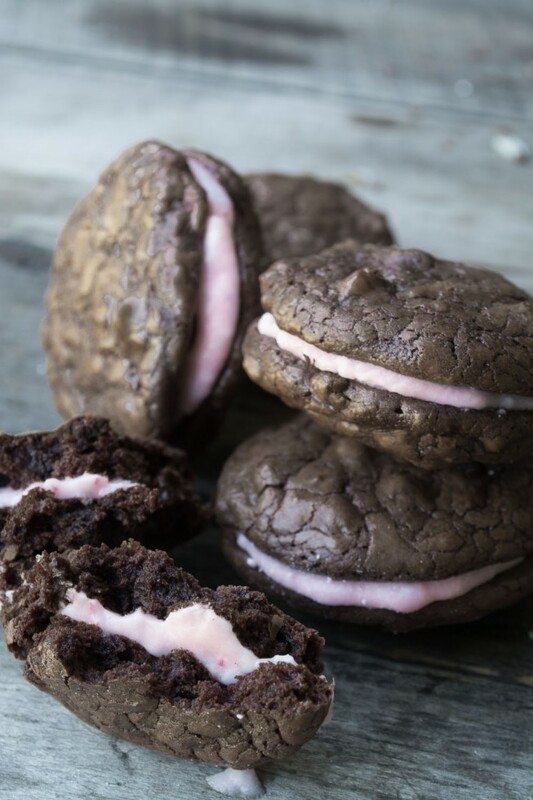 The brownie cookies are very rich, and contrast nicely with the bright peppermint. To vary the filling you can use the basic recipe of one tablespoon of butter, one cup of powdered sugar, and the milk or cream, and from there add other flavor ingredients such as peanut butter, or cocoa powder, vanilla bean, spices like cinnamon or cardamom, instant espresso powder, or whatever you can think of. Taste as you add your flavorings to get the right amounts. 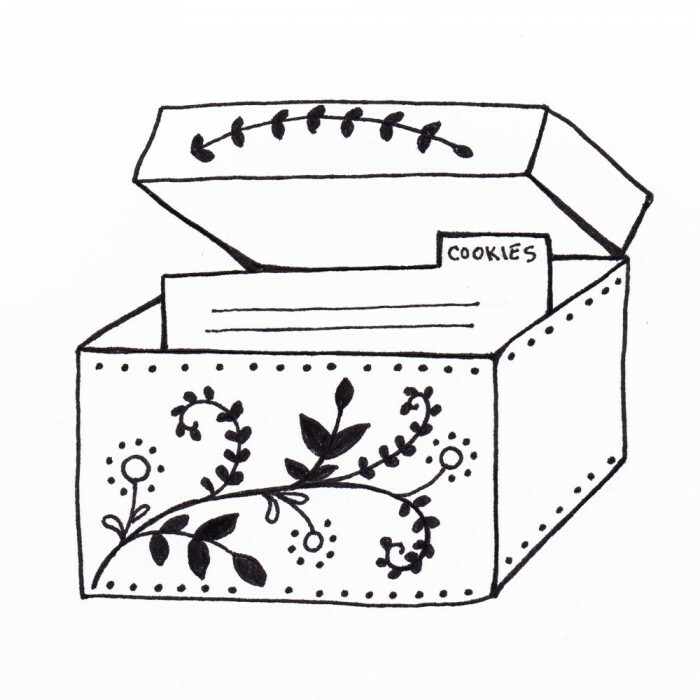 Take care to scoop or spoon out uniform blobs of dough for the cookies, you want them to match up as sandwiches later. I found my 1″ scoop worked best, and I mounded the dough. For sandwich cookies you don’t want them too big because they will be doubled. On some of my cookies I lightly sprinkled more peppermint ‘dust’ along the exposed filling for a festive look. You will need to do this immediately, before the frosting ‘sets’. I used my small food processor to crush peppermint sticks, but you could probably also do it in a baggie with a rolling pin for bashing. Put the butter and chocolate in a microwave safe bowl and heat on high for one minute. Remove and stir to melt the chocolate. Heat a little bit more if needed. When the mixture is smooth, set aside to cool. Beat the eggs and sugar in a stand mixer or with electric beaters until pale and thick. This will take several minutes. Add the slightly cooled chocolate to the eggs and sugar, and gently mix together. Blend in the vanilla. Whisk together the flour, baking powder, and espresso powder and fold into the wet ingredients. Mix just until combined. Fold in the mini chips. Scoop out the dough with a rounded 1 inch scoop and put on a lined baking sheet. Keep the cookies 2 inches apart. Bake for about 7 minutes, or until dry on top and starting to crackle. They will be puffed at first but will flatten as they cool. Let cool for a minute or two on the baking sheet before transferring to a rack. Fill the cookies with the peppermint filling when they are completely cooled. For the filling, mix the butter, sugar, crushed peppermint, and a very small drop of food coloring in a bowl until smooth, adding just a little milk or cream as you mix until you get a good frosting consistency. Spoon a little filling on the underside of one cookie and gently press another one on top. Love this flavor combo and they look amazingly delicious! I absolutely love pairing chocolate with peppermint. Great featured recipe, Susan. I am saving this for X’mas! They look so beautiful, Sue. All 3 of my kids are the chocolate mint combo—the hubby is a much harder sell! These would be terrific holiday cookies—I may have to make them for an upcoming cookie exchange, though the kids wouldn’t let them out of the house! I have one daughter who is crazy for the combo, so I always make sure to have one chocolate peppermint treat around. 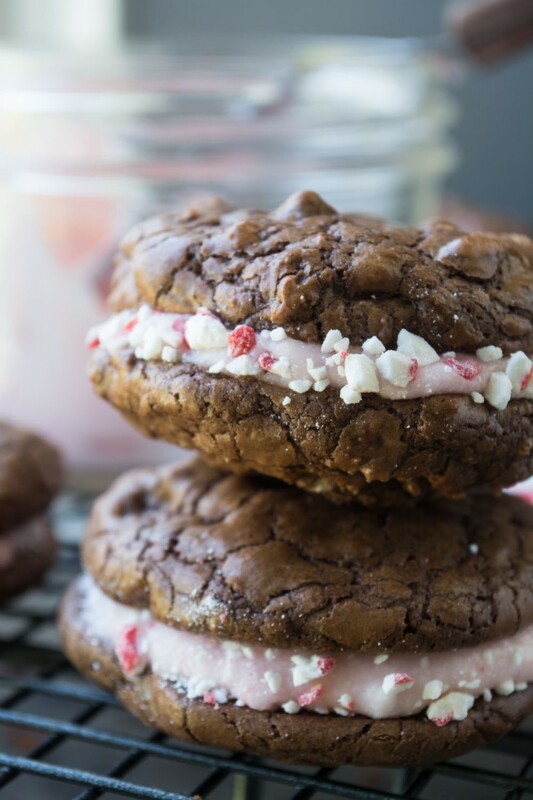 I adore sandwich cookies and chocolate peppermint sandwich cookies are absolutely over the top! Peppermint has always been a Christmas flavor, in my mind. These cookies sound and look delightful! I love the whole chocolate and mint combo so these I’m definitely going to try this Christmas. They look fantastic! Hurray a new Christmas cookie to try! I love chocolate and peppermint! 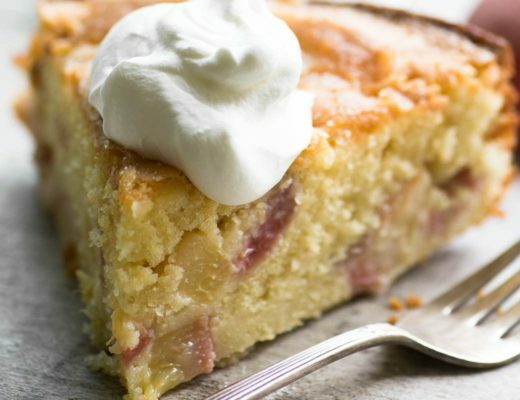 The cracked top is wonderful and the whole cookie looks like the perfect treat! Whoa, now you’re talking my language, these are my dream cookie!